JOHOR BAHRU, JOHOR – The Biotechnology Research Institute of University Teknologi Malaysia uses the technology of stimulating brain waves, the conscious and subconscious as well as increasing the natural learning ability with the aim of solving the learning difficulties of students, improving the attentiveness and having a relaxed learning environment. The institution has designed a headset which stimulates the brain waves and increases the learning pace of students; It inputs the music tone which is able to stimulate the brain waves together with the nature music, records it into a custom made headset. 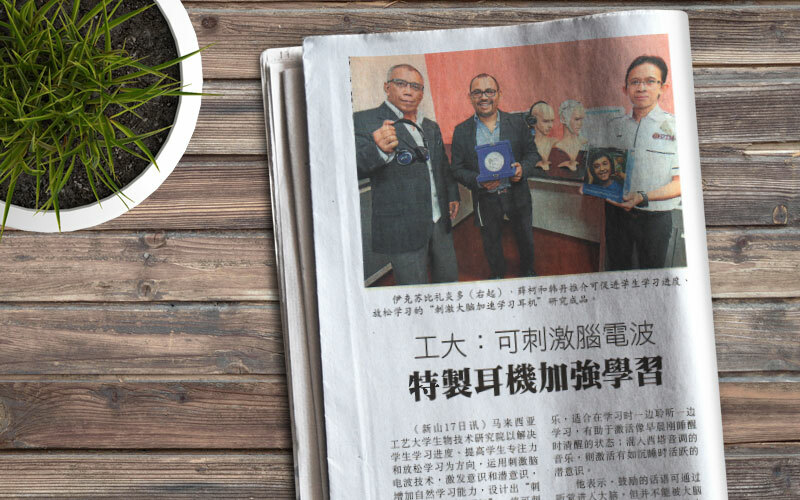 The headset by the joint of the institution and MinDec Research Private Limited Company was introduced by the research institution at 10am; the director of Cardiovascular Engineering Center and diagnostic research group leader Prof. Dr. –Ing. Eko Supriyanto , founder of MinDec Research Private Limited Company Sheikh Mohamad and the chief executive Hamdan Ismail attended the press conference which introduced and explained the concept of this technology. According to Prof. Dr. –Ing. Eko Supriyanto, the initial purpose of this project is to solve the stress and learning difficulties that are facing by students. The technology of stimulating brain waves is used and included into the chosen music; it enables prolonged focus during the learning process and also having a relaxed learning time which is able to improve the natural learning ability. The music categories that are recorded in the headset are Alfa and Theta. The maximum usage per day is 2 hours for Alfa and 30 minutes for Theta. Music that has the combination of Alfa can be used while the student is learning; it helps in activating the brain in the morning. Music that has the combination of Theta can be used during night time. He said, words of encouragements can get into the brain via auditory, but it is not able to be received by the brain cells. Therefore, by implementing the technology of stimulating brain waves, the audio frequency of the music can be directed to stimulate the brain, hence to improve the desired efficacy. He said the usage of brain of a normal person is roughly 12%, however with the assistance of this technology; it will meet the expectation of ‘whole brain functions’ that improves the learning pace. He said that such technology has gone through 6 months’ research and development, 1 month’s literature writing and the 5 months’ clinical and field experiments. Dr. Eko said, in the clinical experiment, there were 25 participants who are between 9 and 24 years old females and males. They were divided into 2 groups of people who use and don’t use the headsets. He said, there are time limits for the use of Alfa and Theta which is the same as preventing excessive exercise of body.